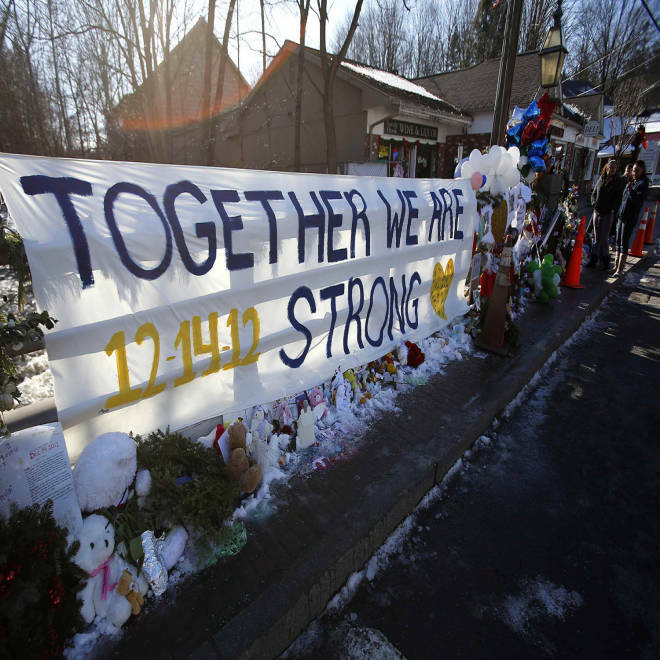 People walk past a makeshift memorial in Sandy Hook after the Dec. 14, 2012 shooting tragedy , in Newtown, Connecticut, on Dec. 28, 2012. They will enter classrooms that have been furnished to look like the ones they left last month, as Adam Lanza carried out his massacre. Desks and even abandoned backpacks and coats have been brought from Sandy Hook in Newtown, Conn., to the new school in Monroe, seven miles away. Greeting the youngsters will be Donna Page, who was the principal of Sandy Hook until she retired in 2010. She agreed to come back after her successor, Dawn Hochsprung, was killed in the rampage. Pupils and parents had a chance to tour the new building – an unused former middle school – on Wednesday after Connecticut Gov. Dannel Malloy met with teachers. When they return at 9 a.m. Thursday, they will find counselors and extra police on hand. “It feels extremely secure there,” Newtown School Superintendent Janet Robinson told reporters. Police declined to say what security measures were in place, but Monroe Lt. Keith White said parents don’t have to worry. “Right now, it has to be the safest school in America,” he said. David Connors, 40, who has 8-year-old triplets, said he knows that sending his kids back to school will be difficult – but crucial. His children, he said, are ready for the transition. “They want to see their teacher. They want to see their classes. They want to get back into a routine,” he said. Students from Sandy Hook Elementary return to school in a new building, seven miles away from the scene of the shooting. NBC's Jay Gray reports. The 500 students have not been in school since Lanza blasted his way into Sandy Hook on Dec. 14 and killed 20 children, six staffers and himself. He had earlier killed his mother. Teachers from Newtown and Monroe spent their holiday break readying the new building for the children, and Robinson said it looks “cheerful and happy” and is decorated with paper snowflakes sent in from around the world. She said the first day back will be as ordinary as possible, and the school will wait some time to honor teachers for their bravery during Lanza’s killing spree, which was largely confined to two first-grade classrooms. "There's certainly going to be children that are scared,” Thalia Andernen, a counselor with The Center of Hope, a nonprofit family support center, told NBC New York. With no decision on what will happen to the Newtown building, the former middle school in Monroe has been renamed Sandy Hook Elementary, and the sign has been removed from the old school. 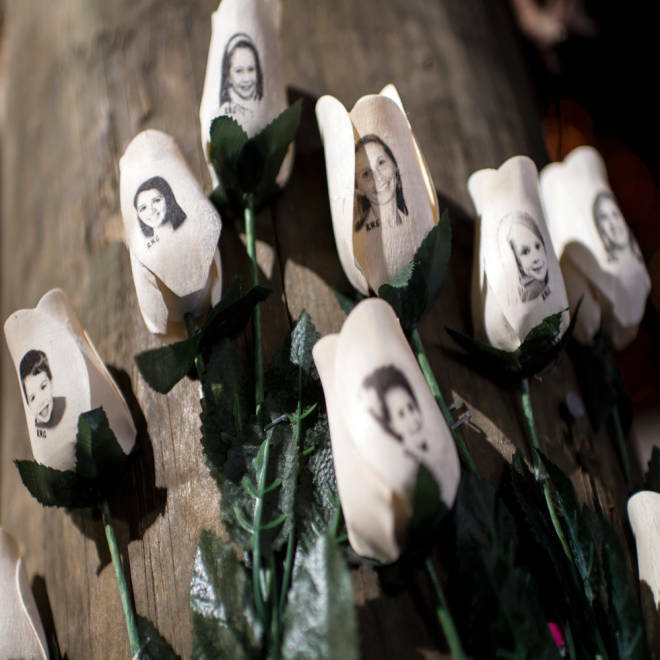 After so many funerals, there are signs of Newtown’s slow recovery. The large memorials that overtook the town have vanished and the Fire Department’s flag is back at full mast, although the station roof still bears a reminder of the toll: 26 stars. A nation mourns after the second deadliest school shooting in U.S. history left 20 children and six staff members dead at Sandy Hook Elementary.